Our research programme can be divided into two principal areas: basic visual neuroscience and clinical vision research. On this page we have summarized some of the main topics within each of these two strands. In addition, we have also included a brief description of some previous research on colour vision in honeybees. This page in currently under construction. Colour is a fundamental aspect of our visual experience and enables us to recognize objects fast and reliably. Traditionally, colour research has focused on colour as an isolated visual feature. However, it is now apparent that chromatic information also facilitates a multitude of other visual tasks and is available in many visual areas in the cortex. 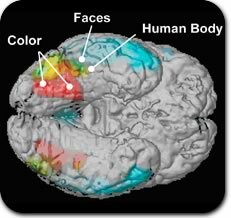 Our aim is to try and understand the functional organization of cortical colour processes and their interactions with other submodalities (e.g. form, depth and motion) and tasks. The results of our research are directly applicable in robotics e.g. for the development of artificial visual systems, as well as for medical advances in visual prostheses. We always perceive the colour of a ripe banana as being yellow – in spite of the fact that the spectral distribution of the light reflected from the banana into our eyes changes under different illuminations (compare the two images, one of which has more red illumination). This phenomenon is called colour constancy. It results from a series of neural processes which comprise all stages of the visual pathways, and even includes cognitive influences. Colour constancy is therefore an important phenomenon which may help to unravel the cortical computations underlying colour perception. Colour and motion perception are generally believed to be processed independently from one another, and for this reason classical colour research has primarily used static stimuli. However, in real life many of the objects we see e.g. people, animals and cars also move. The aim of our investigations is to examine how colour and motion interact. Click on the checkerboard to see how a moving grey square appears to change to a pink colour when the background pattern changes. The visual properties of objects, and the visual control of a hand grasping them, are processed in separate pathways. In this project we investigate how colour signals from the perceptual pathway interact with signals from the motor pathway when guiding hand movements. See also Dyslexia. The relative number of long- (red) and middle- wavelength (green) cones in the retina varies considerably from person to person. We investigate how this influences visual performances such as colour discrimination, colour constancy, and contrast sensitivity. Vision at low light levels (below 0.01 cd/m2, i.e. moonlight) is mediated by the highly sensitive rod photoreceptors and their subsequent neuronal network. In contrast to the retinal functions of rod vision, little is known about the cortical processes underlying night vision. CSNB is a relatively frequent form of inherited night blindness. 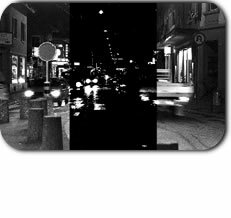 We are interested in the perceptual consequences of this retinal disorder for night and day vision. As the population in Europe gets older it becomes increasingly important to understand the effects of ageing on vision. As we age, the optical media in our eyes become less transparent especially for shorter wavelengths (“yellowing”). There is also a considerable loss of photoreceptors and subsequent neurons, which potentially reduces the efficiency and sensitivity of the visual system. We are interested in how this affects visual perception in the elderly and how the visual system may compensate for age related changes by “hardware” adjustments. Our investigations are primarily concerned with the effect of ageing on contrast sensitivity, colour constancy and transient tritanopia. Dylsexia is a term used to describe reduced ability in reading and writing, in spite of normal intelligence and sufficient teaching. It is one of the most frequent learning disorders and affects 5-10% of the population. We investigate possible deficits in the visual pathways and particular their interaction with the motor system (sensorimotor integration). The honeybee (Apis mellifera) has excellent colour vision, ranging from UV through blue to green (but no red!). As in humans, the bee's colour vision is trichromatic and similar phenomena have been described as those observed for human colour vision (simultaneous and successive colour contrast, colour constancy, etc). The bee is, therefore, an excellent animal model for understanding colour vision on an evolutionary basis.